At Church Street Dental Surgery we pride ourselves on giving our patients the best possible care. Our consultations with Mr Griffin allow him to provide a personal detailed dental examination and provide you with all the information you need about the health of your mouth. A thorough examination helps you and your dentist to look after your mouth to help prevent future problems. The dentist will take the time to discuss and explain all the options available and then you can decide what will be best for you. Regular examinations mean that we can spot problems and correct them early before treatment becomes complicated and costly. We will take a detailed Medical History Questionnaire at your first visit - as your general health and any medications you may be taking can affect your dental care. We will update this every subsequent six months at dental examinations – However, if you have any changes during the year, please do inform us before any treatment. Medical information will be kept strictly confidential. Each tooth will be individually checked and assessed for any decay. We will also closely look at any fillings, crowns or bridges for ledges as these can lead to leaking decay and make these areas difficult to clean. The restorations will all be checked to make sure they are firm and firmly attached to tooth structures. We will closely look at any dentures you may have and how they are affecting the remaining teeth. Dental Implants are becoming more readily available and your dentist is well trained in this field to offer the best advice and long term care for these specialised restorations. A healthy mouth is linked to good general health and costs less to look after. Gums play a major role not only in your dental health, but in your overall well-being. In many instances, swollen and bleeding gums are a sign of gum disease. However, there are a number of other things that could be causing your gum problem. The dentist will ask about your medical history to identify underlying conditions or risk factors (such as smoking) that may contribute to periodontal disease. Your gums around each individual tooth will be closely examined to note any signs of inflammation. The dentist or hygienist will use a tiny ruler called a 'probe' to check for periodontal pockets and to measure any pockets. In a healthy mouth, the depth of these pockets is usually between 1 and 3mm. Any signs of gum disease will be discussed with you and appointments with the Dental Hygienist arranged to help you to look after your gums. We will teach you all the techniques you need to help to improve and gum problems and will closely monitor any gum disease conditions. X-rays are a necessary part of our examination and diagnosis. We have now introduced computerised Digital X-rays to our practice. The images are available instantly and are of improved quality to traditional wet film techniques. We are able to discuss with you, the enlarged images on LCD screens in each surgery. This allows us to improve or accuracy in diagnosis and treatment planning. The digital sensors require less radiation than standard X-rays which means you are exposed to less radiation. Around five thousand people in the UK are diagnosed each year with oral cancer but as with all cancers, early detection means early treatment. That’s another reason why regular dental examinations are so important. Your dentist is trained to look for any irregularities that might be an early warning and will be able to offer advice and referral to a specialist if necessary. The Tempromandibular Jaw Joint (TMJ) is the jaw joint which is located by your ear. About 1 in 10 people have symptoms in the jaw joint at some time in their lives. Grinding can wear down your teeth and cause cracked teeth and fillings. Restoring these teeth as well as replacing any missing teeth can help with this condition by balancing the bite. Treatment may also include us providing you with a specially made clear plastic splint which is mainly worn at night. This will help to support the joint and surrounding muscles by preventing tooth movement by evening out the pressure in your mouth. A nightguard or splint also creates a physical barrier between your upper and lower teeth to protect them from further damage. They also help reduce any grinding noises that you make at night. Our state of the art intra oral camera allows us to better serve our patients. 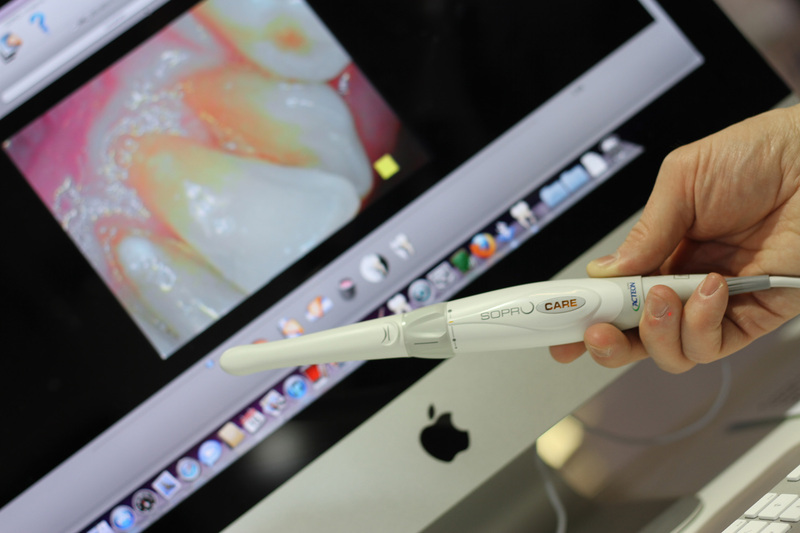 The small camera wand which fits comfortably inside your mouth allows us to capture magnified images of your mouth. It aids us in early diagnosis of decay in your teeth and inflammation of your gums. We can then display them on our LCD screens to see any problems up close and discuss together with you the appropriate treatment options. Do you want to upgrade your smile? Tell us if you would like to improve your appearance and we can offer expert advice on cosmetic treatments. From teeth whitening, veneers to teeth straightening with clear, nearly invisible braces.